Anarchist wallpaper #4: Don’t Move for the Rich. Fight Gentrification! Here is the 4th Anarchist wallpaper published in June 2018. This time the wallpaper covers the subjects of gentrification and the possibility of attack. Download the wallpaper, print it and spread it. Don’t Move for the Rich. Fight Gentrification! A silent killer is crawling through the city. A silent killer whose sights are set on everyone who is not rich enough or doesn’t fit in the current trend of the city. A silent killer who is trying to clear a path in the city for expensive shops, yuppies and pop-up stores. This killer is called gentrification and through urban renewal it is pushing out those who do not belong to the upper class out of the city. You can see it happening in all the cities across the world. Working class neighbourhoods are being transformed into hip shopping streets to attract the rich: an attempt to increase a neighbourhood’s so-called value. The consequences are rent hikes and the removal of people who have lived in these neighbourhoods for years and have their social networks there. Where should these people go? The developers, politicians and the rich yuppies don’t give a damn, because if they can’t make money off of you, you are not interesting. In that case you are an inconvenience. So let us be an inconvenience. Gentrification has many aspects and many different participants. It’s not only the developers who want to enrich themselves with real estate who are to blame. It’s also the housing corporations who sell social housing to the highest bidder so that cheap housing disappears. It is also the city council who applauds the process so that they can brand and sell the city as a metropolis and attract more big companies, tourists and institutions to the city. This doesn’t only affect our housing situation. It also affects the composition of the city: all the stains are removed. Everyone who doesn’t fit into their perfect image is pushed out, every expression on the streets is crushed. Graffiti is removed and those who call the streets their home – the youth, the homeless, etc. – are chased away. The city is infested by cops and a camera hangs on every street corner so that everyone can be watched and the perfect image protected. The city has become a commodity, a concrete tunnel where people can come and spend their money in the same coffee bars, boutiques and cupcake shops. The city is the new factory; it is the method with which the upper class enriches itself. But the city doesn’t belong to those who try to oppress us and remove us. The city does not belong to finances and the upper class. The city is a space where we should be able to live and develop ourselves without the interference and pressure. We have to reclaim the city and defend our neighbourhoods. To wait is not an option; we have to attack those who oppress us. Those to blame are not untouchable. The real estate developers have offices. The council has infrastructure and meetings. The police who repress us violently have vehicles and camera’s. And of course the rich themselves who own real estate, luxury restaurants and expensive cars. The variety of enemies is big but this also provides different opportunities for attack and creates targets for a dynamic intervention. If we are repressed everywhere by state and capital, we can strike everywhere. It’s not necessary to wait for a mass uprising. We won’t be kicked down any longer. From now on we’ll kick back. If we keep waiting the odds will always be stacked against us. Even if the means are divided unequally, the possibility of attack lies in our hands. The choice for revolt is always present! We won’t be pushed out. Fight Gentrification! Do you want to give so yuppie shops, banks and offices a new colour? Then a fire extinguisher filled with paint is the perfect way of doing it. You need one which functions with powder. Make sure the extinguisher has a turn-top with grip edges. 1. Screw off the top. You can get it loose by using a hammer. 2. Now you can pull out the top and pressure compartment and empty the extinguisher in a garbage bag. Wash away the last of the powder with water. 3. Fill the extinguisher with paint and screw the top back on well. 4. Ready for action. Time to hit the streets! 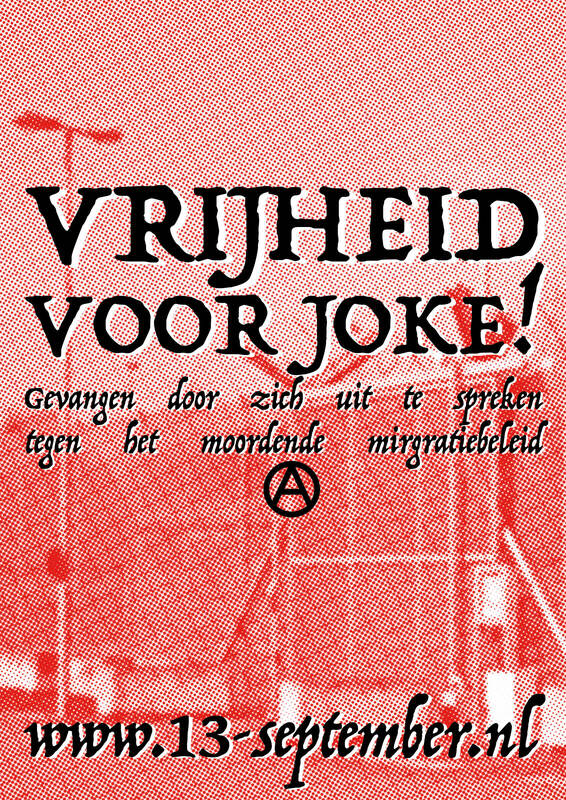 ← Anarchistische Muurkrant #4 Niet wijken voor de rijken. Vecht tegen gentrificatie!